For those of you who don’t know, for the past three weeks I have been in my parents’ home in sunny California! Mr. 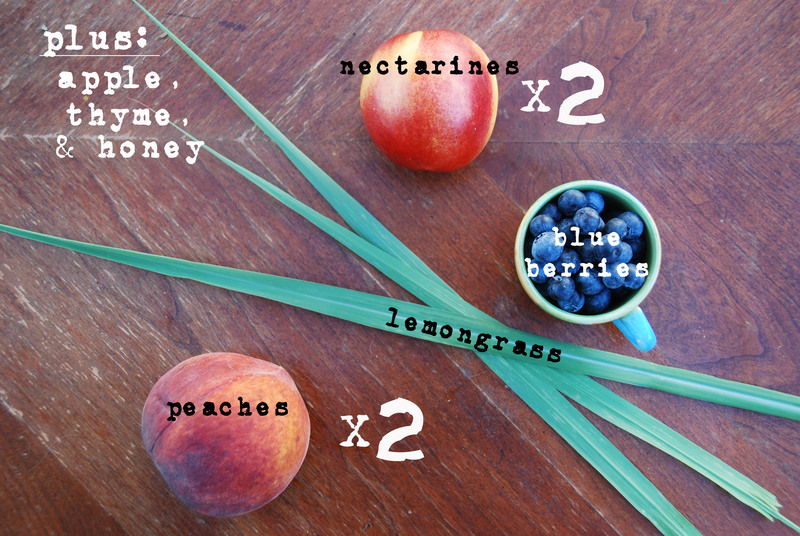 Graceful and I are having a great time here and in the midst of preparing for the upcoming holiday, I thought it would be appropriate to give you guys a recipe that really celebrates the end of summer – summer, with its wonderful stone-fruits, berries, and free time! 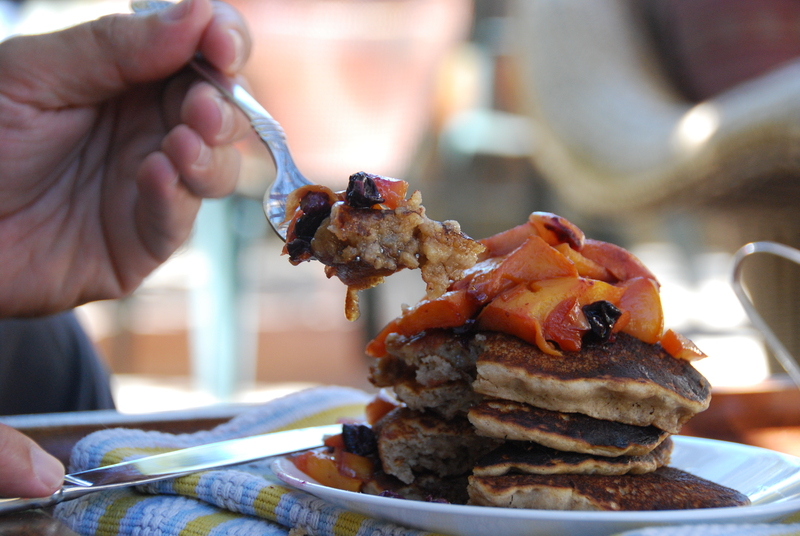 These pancakes really don’t take long to make, but they should be enjoyed in a lazy, late breakfast that draws on until lunchtime. This recipe was born the best way a recipe could be born – during an amazing vacation! We were staying in a beautiful cabin by Russian River in Monte Rio, California. Every day, we made crazy meals, played board-games, and chilled out by the river. On the last day, we were supposed to be out by noon, so we knew our breakfast would not be as extravagant as the previous ones (or start as late and last until noon). But on that morning, I decided I am going to make pancakes. And that’s how I got everyone to think I know what I’m doing. 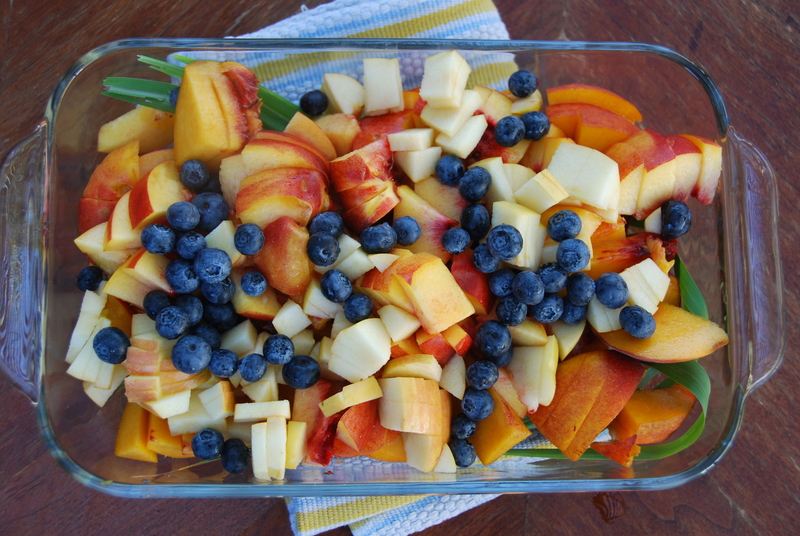 Since we were packing everything, we needed to get rid of as much stuff as possible, so my mom took all the too-juicy fruits, chopped them up, sprinkled them with sugar, and stuck ’em in the oven until breakfast was all set up. When she took them out, they were oozy and caramelized, almost like homemade jam! We happily ate the delicious pancakes topped with the sweet goodness of those fruits, and only when we were finished did we realize there was no way we would be out of that house in time for check out. The management was really chill about us still being there though, so no worries. I highly recommend that place to anyone looking for an incredible, relaxing, rejuvenating vacation in northern California. I realize that for a recipe titled “no-fuss” anything, my instructions are quite lengthy… But you are already used to that by now, aren’t you? I try to break down the recipes here so that even the most culinarily-challenged individual would experience success with them, and that is why they sometimes get so long. But really, this recipe is super-easy, and no fuss is involved at any point. Just a few ground rules to remember. Mix the dry with the wet in the last moment. Use very hot skillets. On that note, use as many skillets as you can. And lastly, baking powder is your friend. Think you are ready? Let’s go! 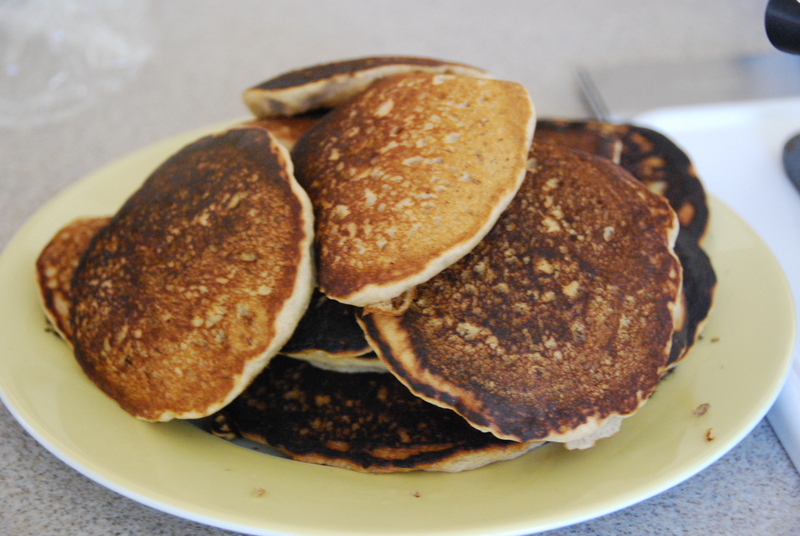 Pancakes: 20 – 50 minutes (depends on number of burners). Fruit sauce: 1 Hr. 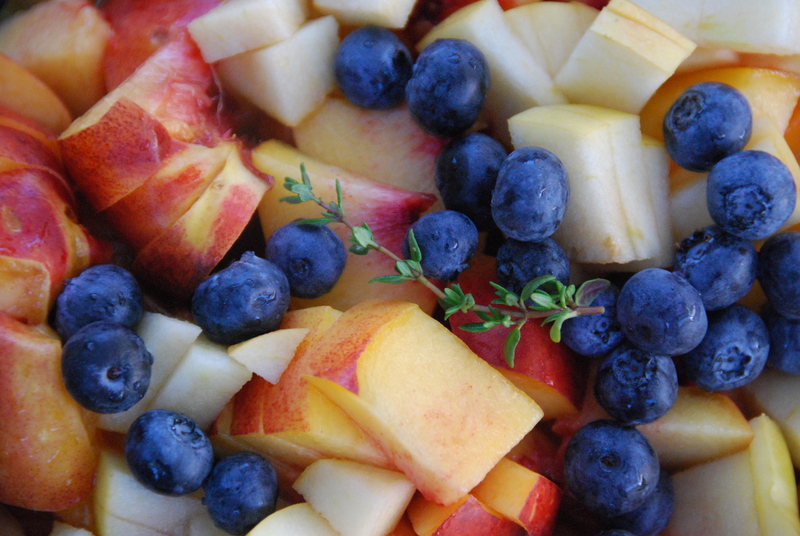 If you are going to be making the fruit sauce, which I highly recommend you do, you best start with that. It is a bit time consuming (as it needs to bake for an hour) but well-worth it (and otherwise pretty much effortless). 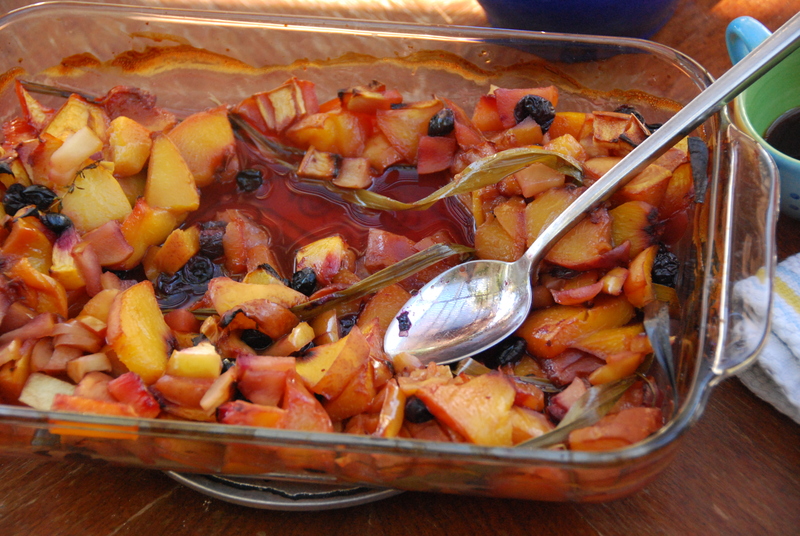 To make the fruit sauce, preheat the oven to 240 degrees Celsius, which are 470 degrees Fahrenheit). 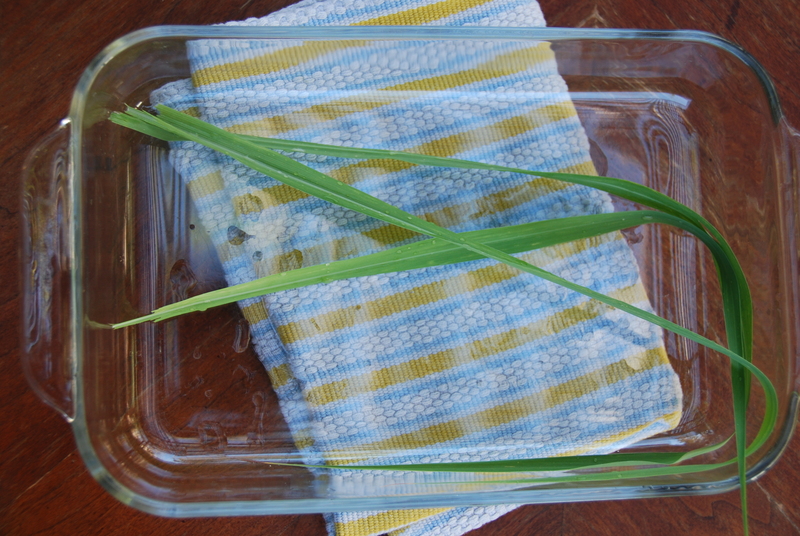 Arrange the lemongrass leaves in the bottom of an ovenproof dish (big enough to comfortably stir all the fruits in later). 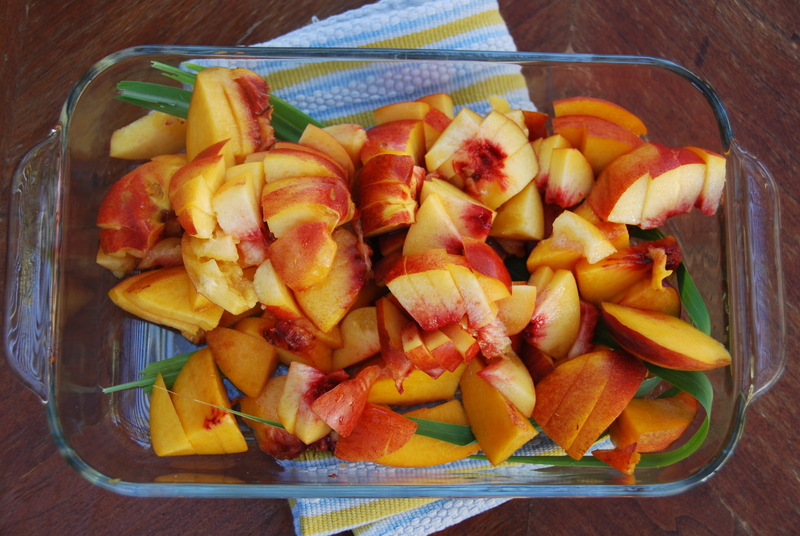 Chop up the peaches, nectarine, and apple, and add them to the dish. 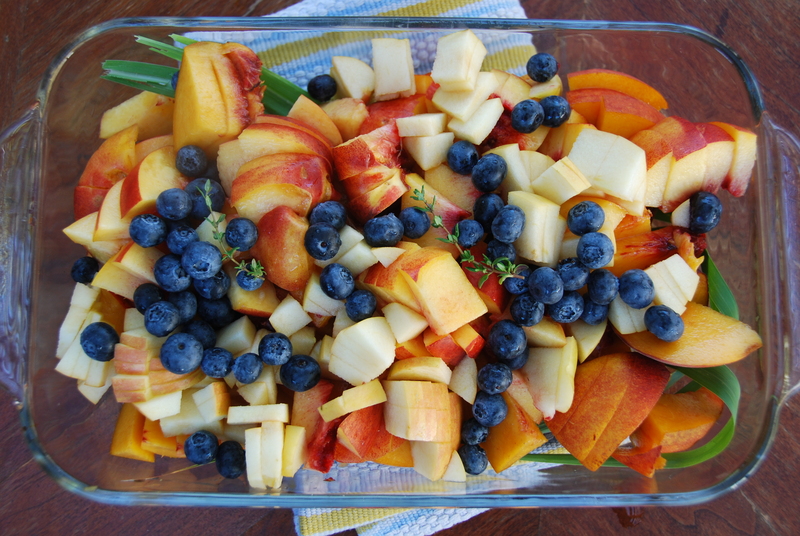 Unlike what is shown in the pictures, the best strategy is actually to use the least juicy fruits first, so that they are on the bottom and are constantly simmering in the other fruits’ juices. So for our purposes, the order would be first apple, then nectarine, and then peach (yes, the exact opposite of what I did – I ended up needing to stir quite a few times to get the right effect). Add the blueberries on top (you can also use dried blueberries or even raisins, but then they should not be the topmost layer) and the thyme. Drizzle the honey evenly on top of everything, and place in the hot oven. 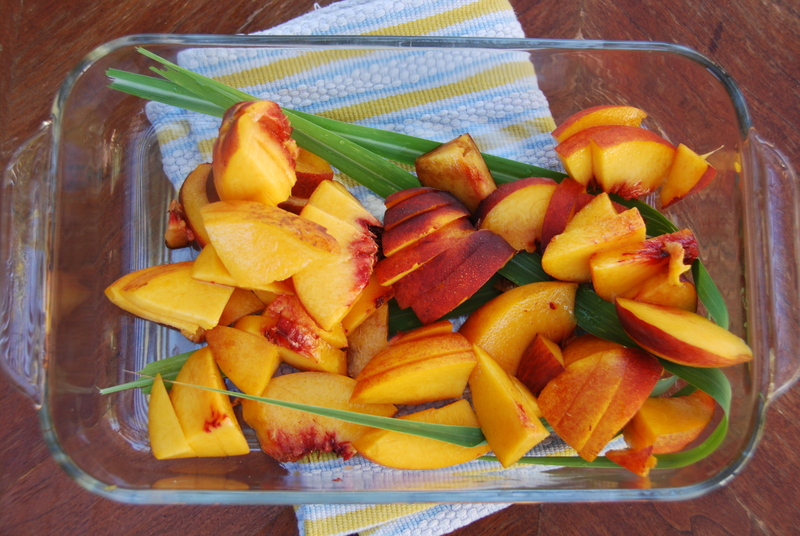 Bake for about an hour or until the fruits are tender and slightly browning at the edges. You will probably need to stir everything once or twice during this time. Now that all that awesomeness is baking away in the oven, we are free to make the pancakes! 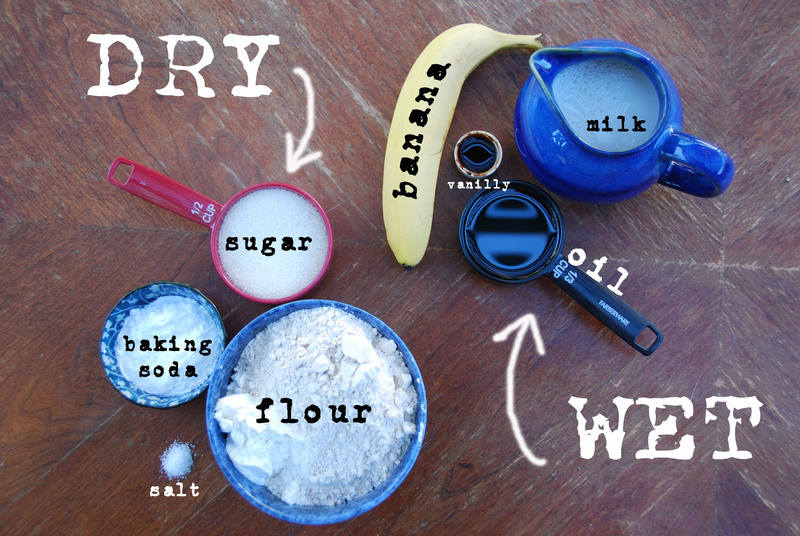 In a mixing bowl, whisk together the flour, sugar, salt, and the baking soda. Yes, I am aware that two and a half tablespoons is an obscene amount of baking soda, but it is completely necessary for this recipe to work. 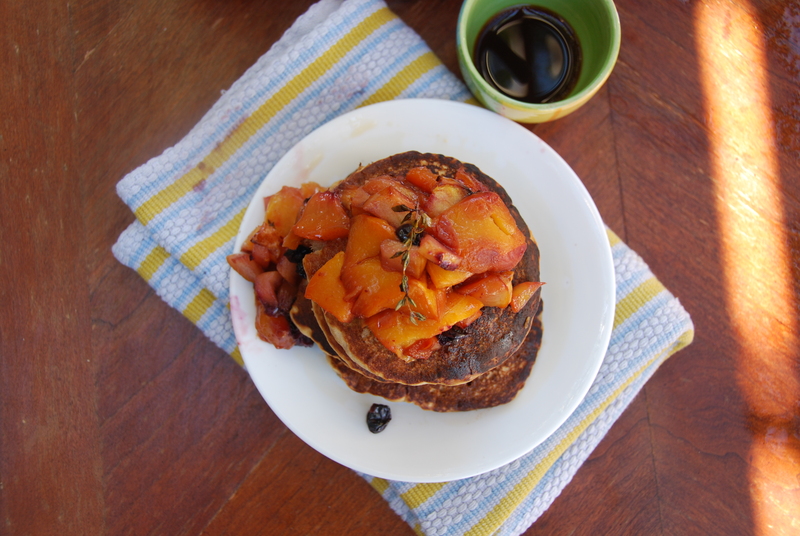 Since we are not using eggs or egg-replacers, that baking soda is our ticket to nice, round, fluffy pancakes as opposed to shapeless blobs of vegan shame. It will make the pancakes rise just a bit upon contact with the hot skillet, and that’s the secret that makes this recipe work. 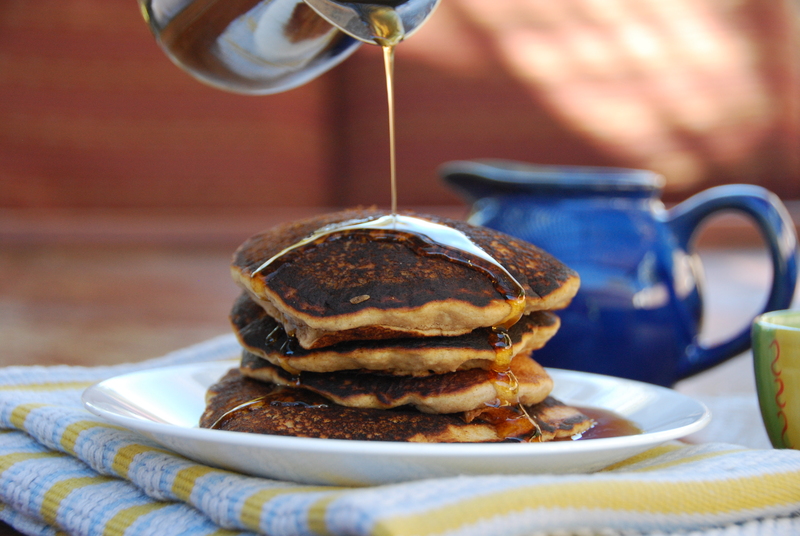 If you like your pancakes on the less sweet side, or if you are going to use very sweet syrups, you can probably take the amount of sugar down to 1/3 cup or even 1/4 cup, since the bananas add some sweetness as well. Try it out and decrease the amount each time you make it, until you find the sweetness that works for you. 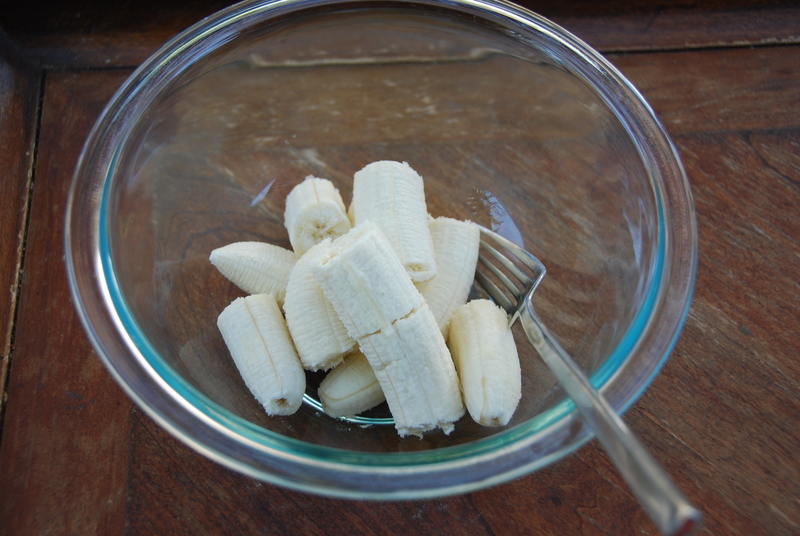 In a large mixing bowl, mash the bananas with a fork (it’s okay if little bits are visible, just make sure they are quite small). 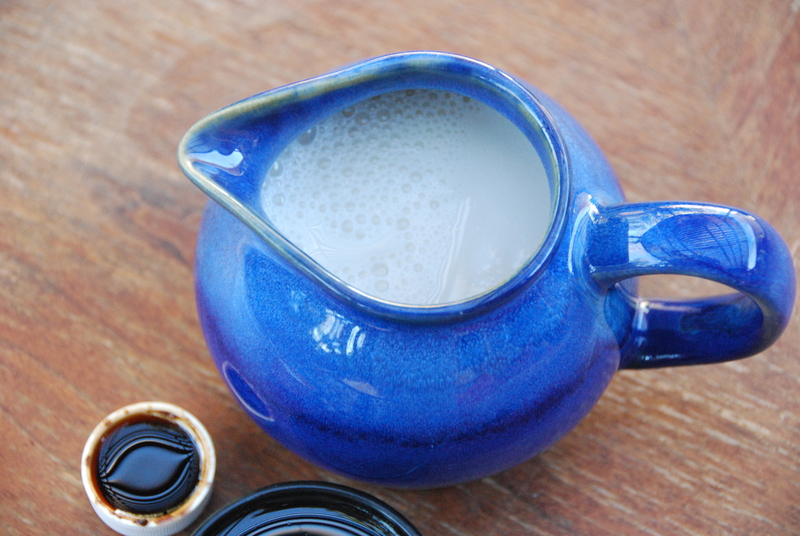 Add the milk, oil, and vanilla and stir until combined. 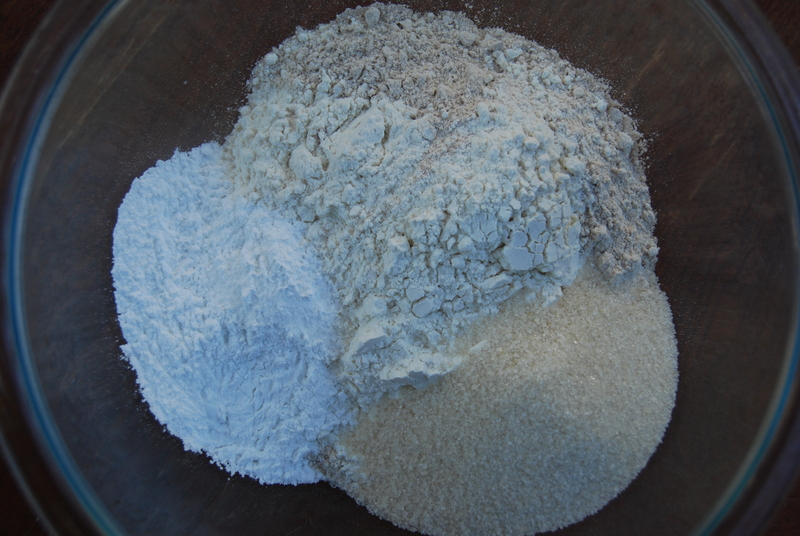 The second you mix the wet and dry mixtures, the baking soda will start working its magic, so in order to make sure you are ready to work right away, prepare your pancake-making area. Set up a large plate for the ready pancakes. Heat up as many non-stick skillets as your burners will allow you to. 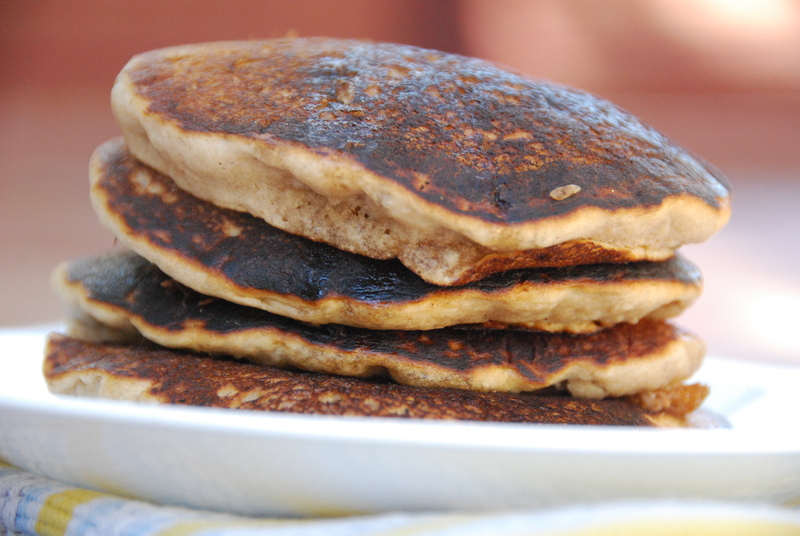 The more burners you use, the faster you will be finished making all the batter into delicious pancakes. Less time in front of hot skillets and have my pancakes earlier? Yes please, sign me up. 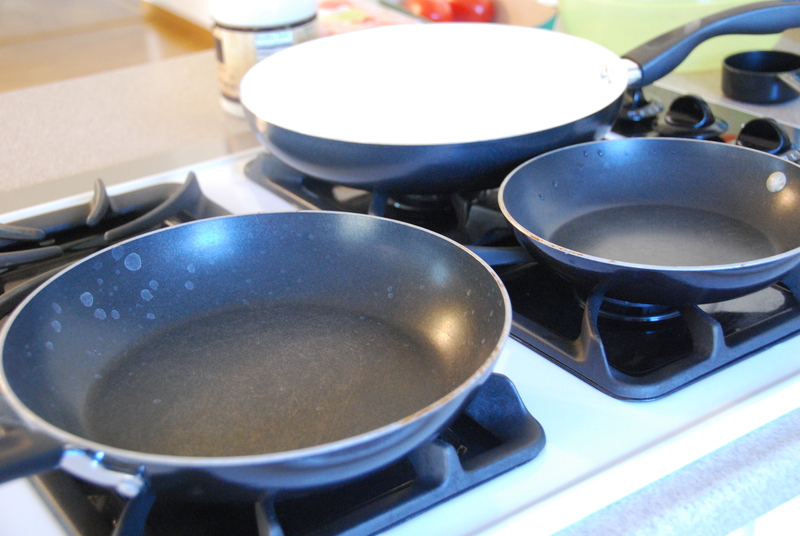 I like to work with three skillets because it’s a huge time-saver but still quite manageable. 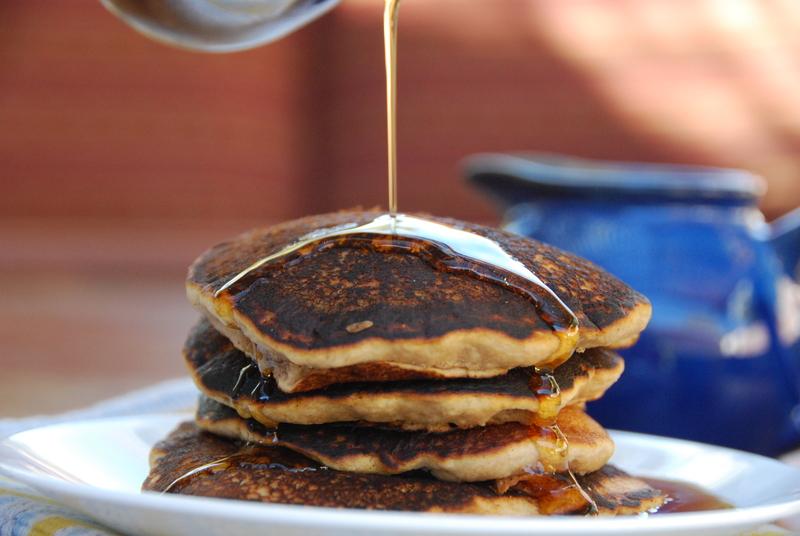 The only catch is that you will need to devote yourself completely to the pancakes for this time – you can’t just plop on some batter and then go do something else, because there are constantly going to be pancakes that are ready, cooking, and starting – but the whole thing will be over in about 15 minutes. It took me about 20 minutes from start to finish working with three skillets. To find out how much time to expect with less skillets, add roughly 15 minutes to each skillet you subtract. 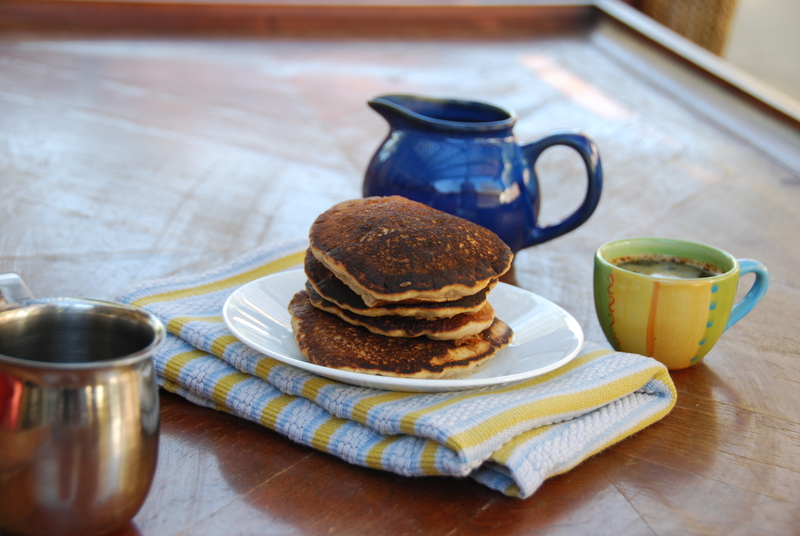 Got your pancake platter and your burners all set up? Great, let’s get to work. Heat the skillets on high until very hot. A skillet is considered “very hot” if you drip a drop of water on it and it “dances” around on the surface of the skillet. 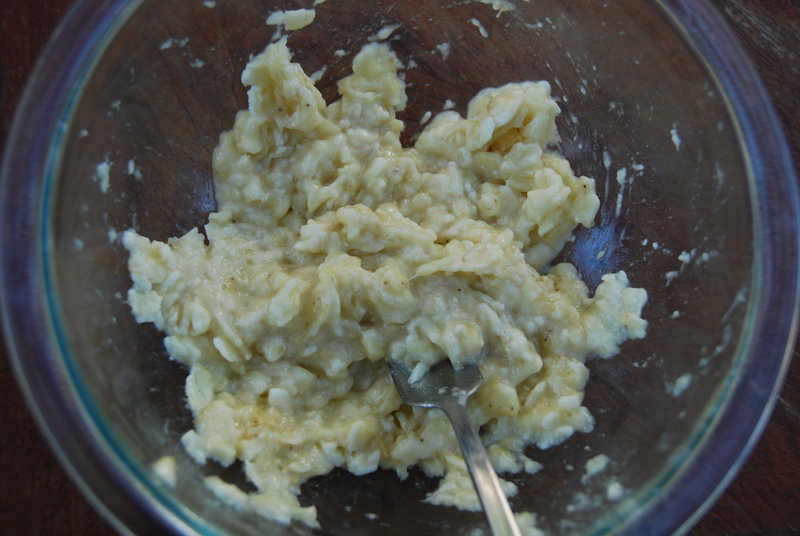 Pour the dry mixture into the wet mixture and whisk until no lumps are visible. Turn the burners down to medium-low. Very lightly grease your skillets with some oil. I like to make this even lighter by using a paper towel to spread a drop of oil very thinly across the pan. More oil is not better for this recipe, so don’t be tempted. Drop 1/3 cup batches of pancake batter into the skillets. 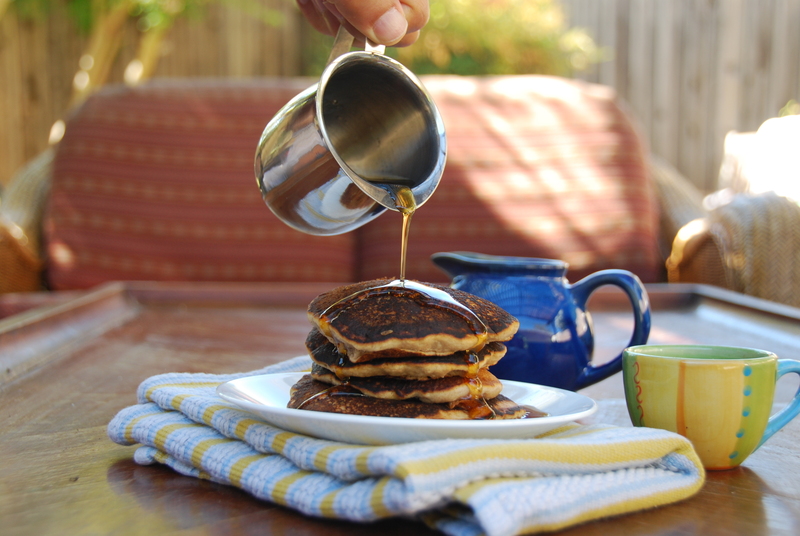 Flip each pancake over as small bubbles form around its circumference. Do this gently, checking if the pancake is actualy ready to be flipped as you go. If it squashes or gives you trouble, give it some more time (just a few seconds should do it). Cook the other side until it browns slightly on the bottom, about a minute (or less – after you are done with the current round of skillets, check the bottom of the first one to see if it has already browned). Transfer the ready pancakes to the ready-pancake-platter. Repeat until you run out of batter. 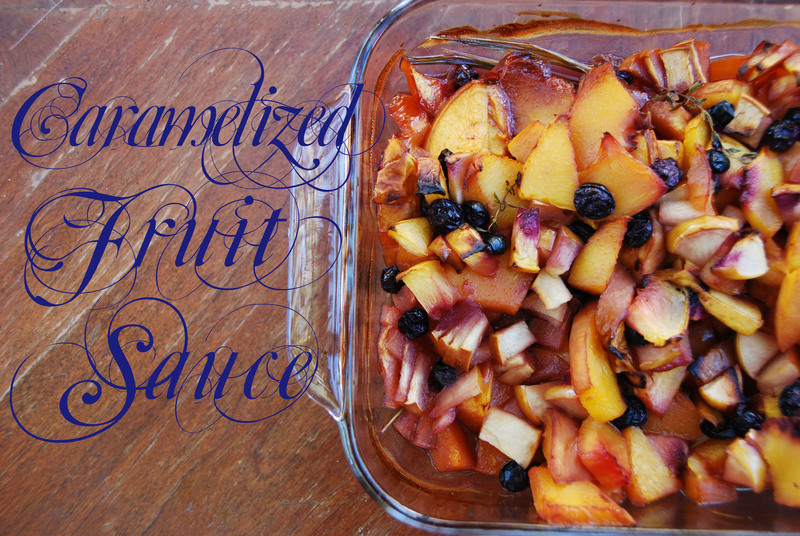 Serve warm with the fruit sauce or any topping of your liking. 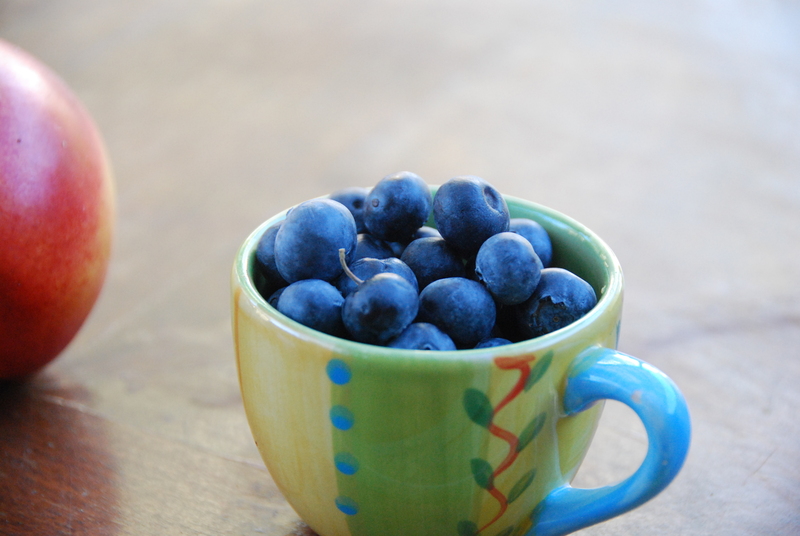 You can also experiment by adding berries or other pieces of fruit to the batter. 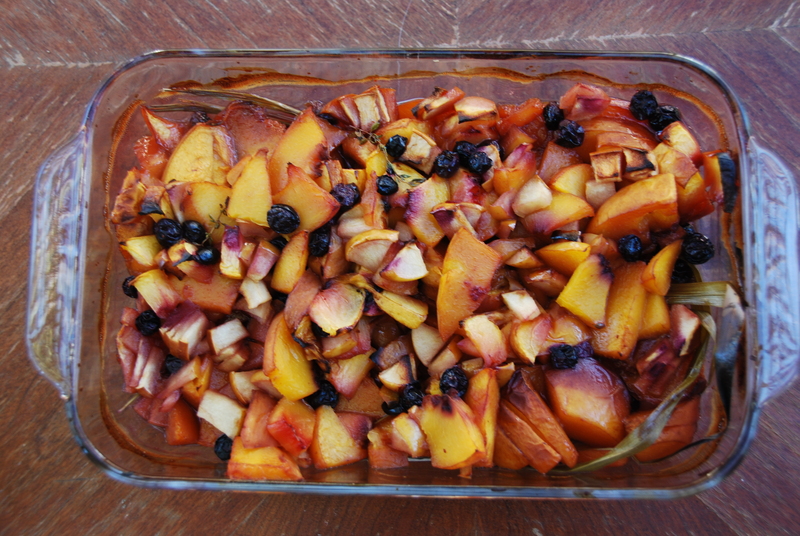 Make the fruit sauce: Preheat oven to 240 Celsius (470 Fahrenheit). 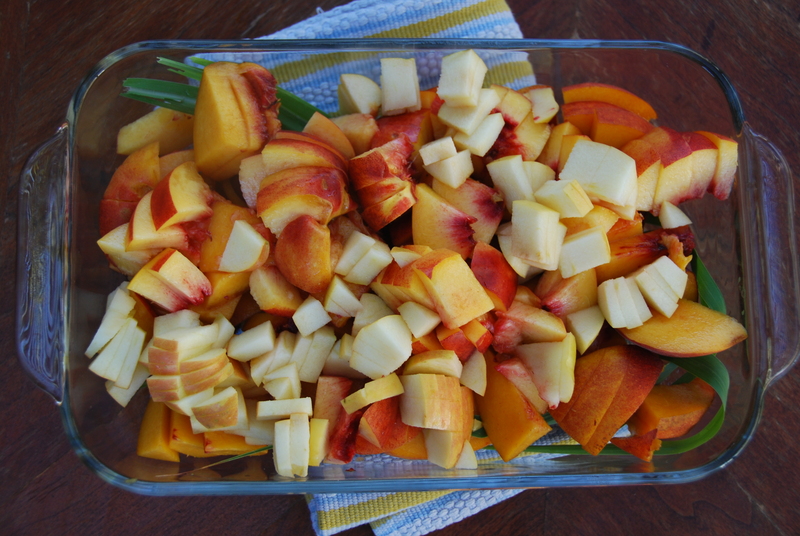 Chop 2 large yellow peaches, 2 large, juicy yellow nectarines, and 1 apple of your choice. Put them in an ovenproof dish along with 2-3 lemongrass leaves and 2-3 small sprigs of thyme and bake until tender and slightly browned, about 50 minutes (mix once or twice in between if needed). 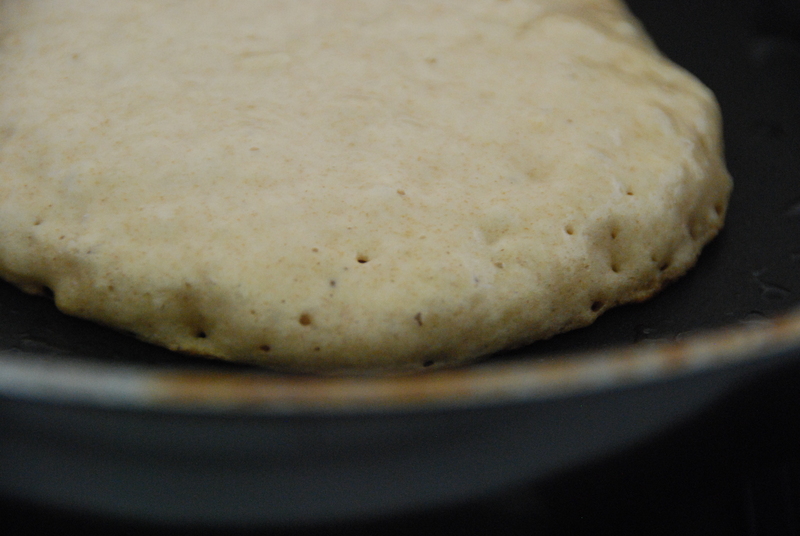 Make the pancakes: Sift or whisk together 2.5 Tbs. baking powder and 2 cups of flour, then whisk in 1/2 tsp salt and 1/2 cup minus 2 Tbs sugar. In a separate bowl, mash 3 small bananas. Mix in 2 cups milk of choice, 1 Tbs. vanilla extract, and 1/3 cup oil. Heat up as many skillets as you can simultaneously over high heat. Pour the dry mixture into the wet mixture and mix until no lumps are visible. Very lightly grease the skillets, and drop 1/3 cup batches of pancake batter into them at a time. 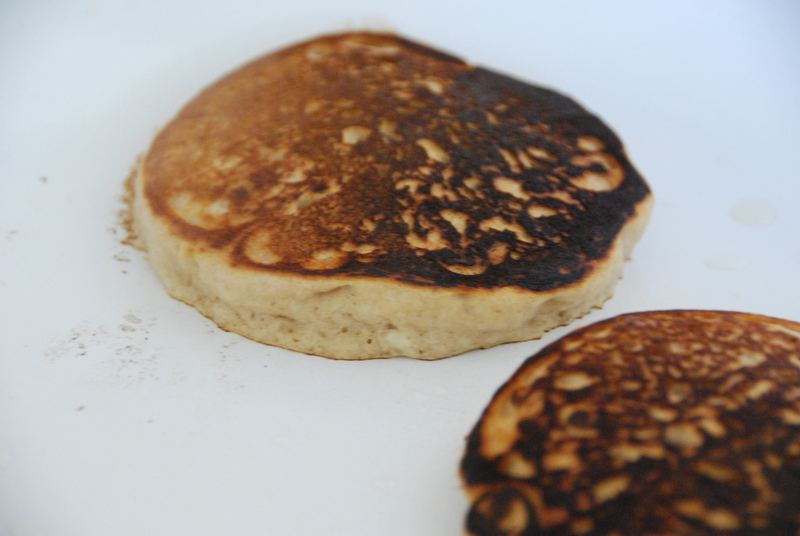 Carefully flip each pancake as bubbles form on the outside of it, about 1-2 minutes. Remove from skillet after 1 minute or once other side browns sufficiently. 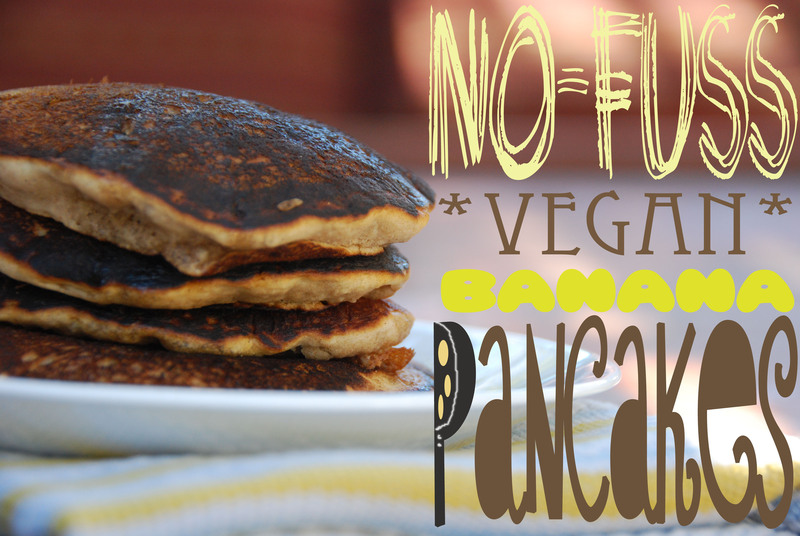 This entry was posted in Breakfast or Brunch and tagged banana, easy, special treat, vegan by Adi. Bookmark the permalink. 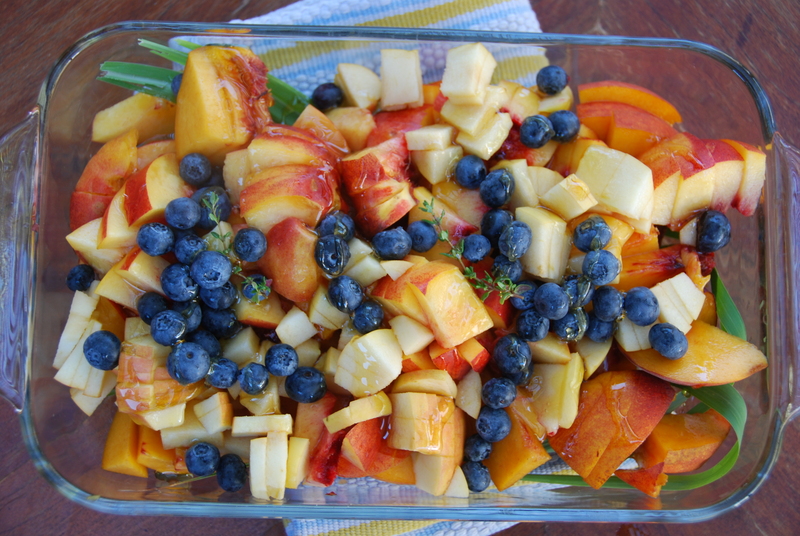 Beautiful appetizing pics & what a great combo of win win ingredients! Yummmmmm! Yum indeed :) Thank you so much!